Deep-frying is one of the most popular ways to cook food. People all over the world enjoy the crispy and golden brown deliciousness of deep fried food. It may not be the healthiest way to eat, especially if it is done regularly, but it does satisfy those late night food cravings. Just like with everything else in life, moderation is key when it comes to eating fried food. Having a deep fryer at home allows you to cook food that is a little bit healthier than takeout and fast food options. Since it has been established that eating a lot fried food is not very healthy, there is another option you can look into, which is the air fryer. This method of frying involves the use a very small amount of oil and hot air is blasted inside the unit which creates a final product that closely mimics the taste and texture of traditionally fried food. With this option available, why then do people still go for the deep fryer instead of the air fryer? At first glance air fryers and deep fryers look very similar. This is because of these two types of fryers that have similar features. These features can include adjustable heat controls, timer, oil filters, and even controls that are designed to be user-friendly. The only feature that makes the air fryer standout is it has a convenient on and off switch which makes it much easier to use than a traditional air fryer, even one that has a preset thermostat. Another similarity between the two fryers and their features is that they become more expensive when they come with a long list of features. Air fryers are usually smaller than deep fryers which also results in them cooking a lesser amount of food in one “frying.” A deep fryer may require a bigger and heat-resistant countertop in a kitchen, but it is better if you want to fry a larger amount of food. Plus, if you invest in a deep fryer with different basket sizes you can fry more than just type of food at the same time. This makes it more efficient in cooking than the air fryer. If you have a tight budget, the deep fryer is a better choice compared to the air fryer. 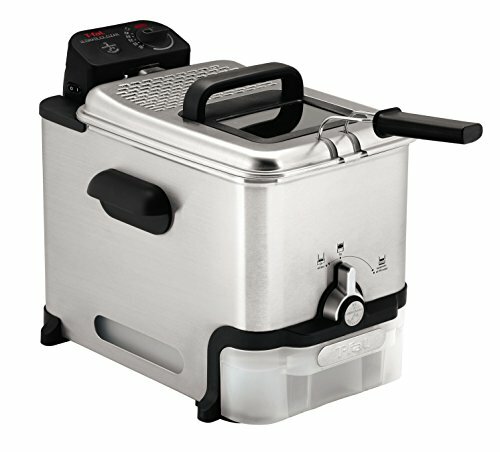 Most deep fryers cost bellow $100 while new air fryers are priced above $100. 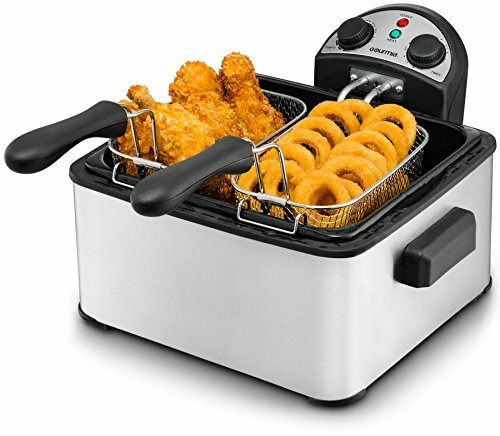 If you want to get your hands on traditionally fried food and the amount of oil used isn’t a concern for you, the deep fryer is your frying machine. If by now you are convinced that a deep fryer is the better choice, it’s time to learn more about maintenance and cleaning the unit. There’s nothing more frustrating than using a fryer that is oily to touch and full of grease and food debris. This is very unsanitary, and it will also reduce the lifespan of your unit. Here are some simple cleaning tips to follow to make sure your fryer is always in tip top shape. Tip 1: Setting Up for Cleaning. Before you get right down to cleaning your fryer make sure you do the following for safety reasons: unplug the machine, let the oil cool down, dispose or store oil properly. Never throw used oil down the drain! Tip 2: Wipe First. Don’t just start with cleaning products; the amount of grease can render your dish soap useless. Instead, wipe the inside of the fryer with a paper towel so that the excess oil and grease are absorbed. This step makes it easier to clean. Tip 3: Warm Water and Soap. Use a sponge and dip it in a solution of warm water and dish soap. Gently clean the inside and outside of the unit, being extra careful water does not spill on the electrical parts of the fryer. Rinse the water-safe parts of the unit when done. Bonus Tip: If a foul-smelling odor develops, take a 1:9 ratio of vinegar and water solution and put it in the fryer. Let it soak for a few minutes and then rinse. 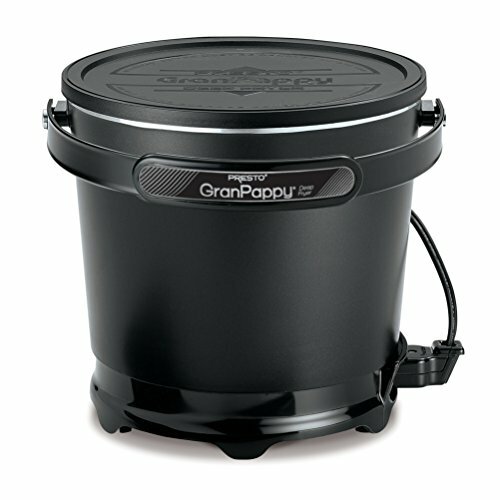 The key to taking care of your deep fryer and ensuring that it lasts a long time is to clean it regularly. Don’t let grease and debris build up for a long time or you might end up throwing away your deep fryer earlier than you should have. Now that you have learned the basics in deep fryer care, cleaning, and maintenance you’re probably looking forward to frying up some food at home. Here’s a short list of some of the highly recommended deep fryers worth looking into if you’re shopping for one. When it comes to kitchen gadgets, Hamilton Beach is one of the most popular brands. They have been producing kitchenware for over a century, and their Hamilton Beach Deep Fryer with Cool Touch has also made many people very happy. 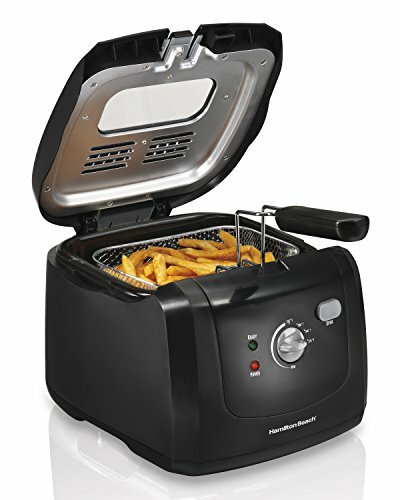 Hamilton Beach has made deep fried food easily accessible to home cooks everywhere. This review will cover the different features, the pros, and the cons that come with owning a Hamilton Beach Deep Fryer with Cool Touch. If you are on the search for an affordable deep fryer that can cook more than enough fried goods for two people the Hamilton Beach Deep Fryer with Cool Touch is a great product to check out. It is a highly trusted brand that has made many home cooks happy with their purchase, and it might just transform your kitchen too. Dealing with hot oil to get that perfectly deep fried and golden brown food can be dangerous, especially if you’ve never tried deep-frying before. Although frying is one of the easiest ways to get tasty and delicious food, you could end up injuring yourself if you don’t know what you’re doing. Plus, frying in a shallow pan or a pot creates a lot of oil splatters which can be a hassle to clean up afterward. Facing these challenges can turn a person off from deep-frying. Lucky for fried food lovers, there are electric deep fryers like the T-fal Oil Filtration Ultimate EZ Clean Immersion Deep Fryer. Here you will learn more about this deep fryer to help you determine if this will be a good gadget to add to your kitchen or not. If you believe in getting only the best of the best even when it comes to deep fryers, the T-fal Oil Filtration Ultimate EZ Clean Immersion Deep Fryer will greatly impress you. 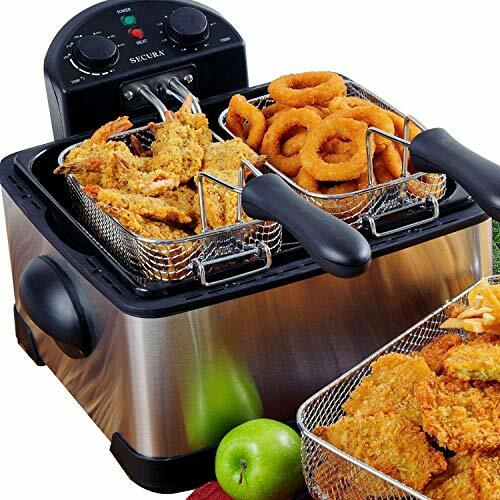 You will never have an unsatisfied fried food craving ever again with this deep fryer in your kitchen. Having an electric fryer at home means you have easy access to your favorite fried food when you get a craving. This also means that you can cut your visits to the fast food joint nearest your home. Although homemade deep-fried food isn’t that healthy, it is a healthier option to fast food. Deep-frying is a matter of waiting for the oil to reach the correct temperature and then frying the food until it is perfectly golden brown and crispy. You can do all this and more with the help of the Presto FryDaddy Electric Deep Fryer in your kitchen. Read on to learn more about this quaint deep fryer. 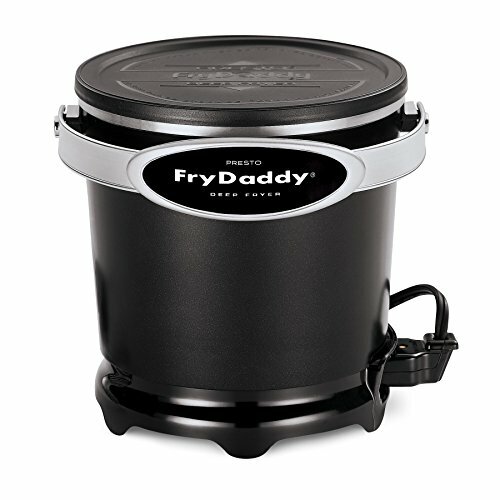 As far as affordable deep fryers go, the Presto FryDaddy Electric Deep Fryer is still one of the best deep fryers within its price range. 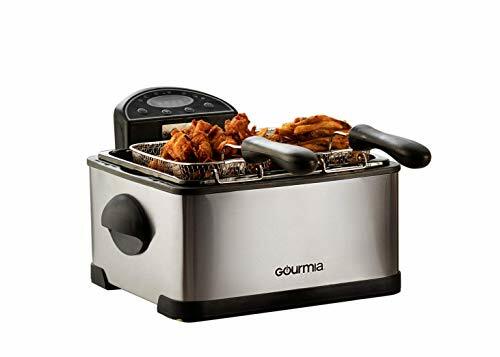 If you’re into frying small amounts of food or you’re planning to enjoy fried food occasionally this is the deep fryer you should add to your kitchen. There is something nostalgic about the smell of fried food. Maybe it takes us back to the time when we were younger and carefree. Or maybe the crispy goodness of fried food just makes us happy in general. Whatever the reason may be, we all have those moments where we look for some comfort in the form of a perfectly fried and crisp food. Having a deep fryer at home doesn’t mean you’ll start binging on fries or onion rings. A deep fryer can give you a treat as a reward for a long week, and it’s also great when you have company over. 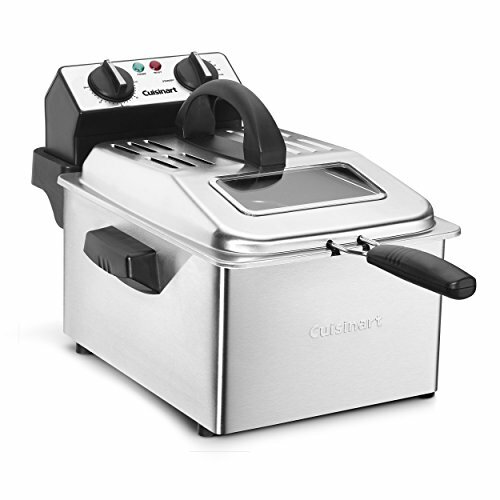 This review will look into Cuisinart CDF-200 Deep Fryer to see if it will be a good deep fryer for you. When it comes to deep fryers that can handle a good amount of frying there’s no other than the Cuisinart CDF-200 Deep Fryer. 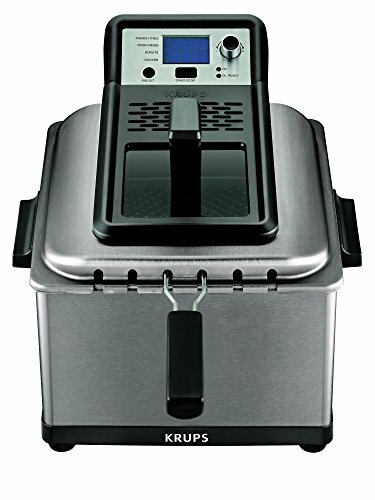 This is the best fryer to purchase if you are planning to fry in bulk or you are feeding a large family. Enjoying fried food in moderation can be a worth it treat. The reason why fried food is so delicious is that hot oil alters the taste of the food and gives it another layer of flavor. Plus, it doesn’t hurt that it has a nice and crunchy exterior while the insides are still nice and juicy. Thinking of all those delectable fried food can conjure up a big craving that needs to be satisfied. Having a deep fryer like the Gourmia GDF500 Compact Electric Deep Fryer can give you easy access to all the fried food you could ever want. From French fries to onion rings, you will be able to make your own versions of this well-loved food and so much more. For those who love variety with the food that they eat the Gourmia GDF500 Compact Electric Deep Fryer makes a wonderful deep fryer choice. 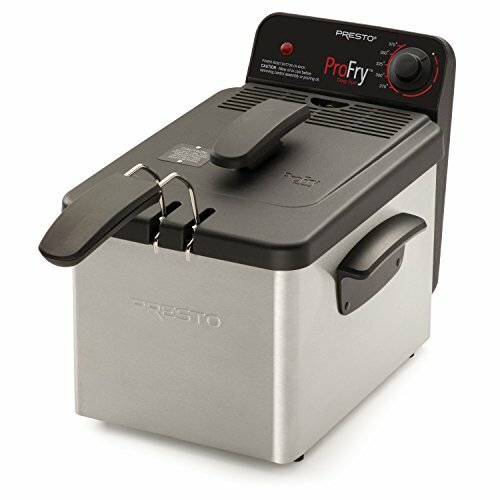 It allows you to fry more than one kind of food at the same time, giving it a clear edge over other brands and models. There is no denying that fried food is delicious, but it is also very unhealthy if too much is eaten regularly. Deep fryers give you easy access to fried food whenever you have a craving, but it is also a way to keep you away from fast food and take out. Remember; when you get your hands on the best deep fryer in the market, don’t overdo it. Eat fried food in moderation ,and you will enjoy this guilty pleasure longer.